When I enter a city name, Google Flights often suggests train stations. For example, I mostly see central stations (hauptbahnhofs) for German cities. None of the combinations I have tried so far return results, even if I choose train stations for both departure and arrival. Why does Google Flights show train stations then? The train stations included are some of those train stations that are integrated with air travel as part of an air-rail alliance for single ticketing. If I just search for flights from PHL to DUS, I can find air-only routes that are faster and cheaper, but the option is there. Wikipedia has a List of IATA-indexed railway stations, train stations with IATA codes, though not all are recognized or bookable through Google Flights. 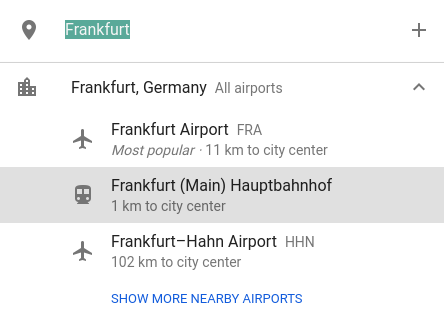 Whilst Zach's answer is mostly factual regarding train stations with airport codes, this does NOT appear to be the situation here (eg, Frankfurt HBH does not have such a code). Instead it appears that, despite the name, Google Flights now supports things other than flights - such as train tickets. In all cases selecting the flights or train trips will take you to the relevant website to book, be that an airline like Lufthansa, or a train company like Deutsche Bahn. It's because Google has decided to incorporate train trips into Google Flights for easier time & cost comparison between flying & riding a train in Europe. We started by adding train options for routes in Italy and Spain. 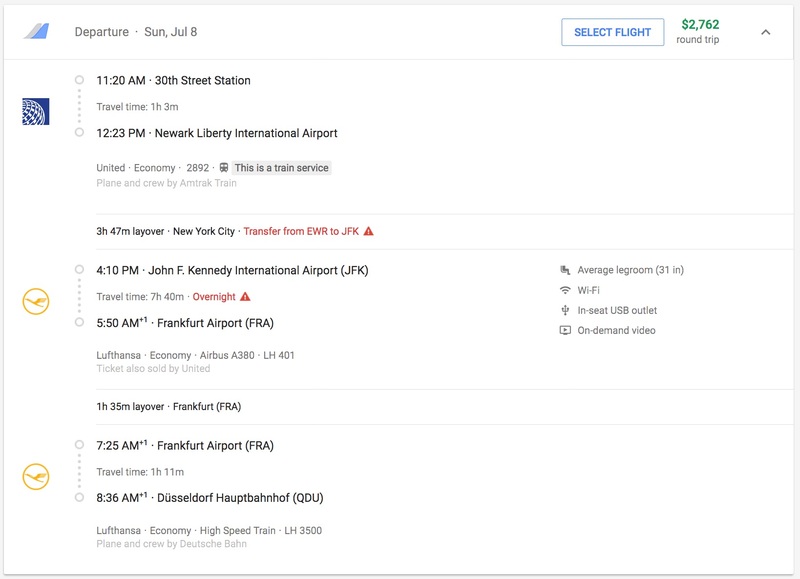 Today we're excited to announce a partnership with Deutsche Bahn in Germany to bring their expansive, fast rail service to Google Flights. From 1983 to 1992, Lufthansa operated "zero level flights" from Frankfurt to Düsseldorf, Cologne, and later Stuttgart. These were express trains that were significantly cheaper to operate and at the same time faster than airplanes (faster because on the short distance the planes never reached full travel height and speed, so they were not that fast, and the time getting on and off the airplane took more time than the flight anyway). They were Lufthansa branded, you had the same service as on a flight, and so on. Just like a flight at zero height. They don't have "official" airline trains anymore, but the principle is obviously the same. With average distances a lot shorter than in the USA, it makes perfect sense to have international flights going to the biggest airports, and then have a connecting train instead of a connecting flight. Plus the train stations are often in better positions; if you go to Köln-Wahn airport there is probably a long taxi ride to the city center, while Köln-Hauptbahnhof is right smack in the center of the town, and you can probably walk to your Hotel. Not the answer you're looking for? Browse other questions tagged online-resources flight-search-engines google-search or ask your own question. Why does Orbitz continually show flights that don't exist? Is there any app that returns a list of cities in Europe for a train travel by entering the departure city?